“What we love doing the most is creating products that make people + earth feel well. We seek standard packaging that is as friendly as possible and put your hard earned cash towards what goes into the bottle. Gluten free + soy free raw materials we choose are not tested on animals, we keep animal by-products out of our products and test our products on friendly people. 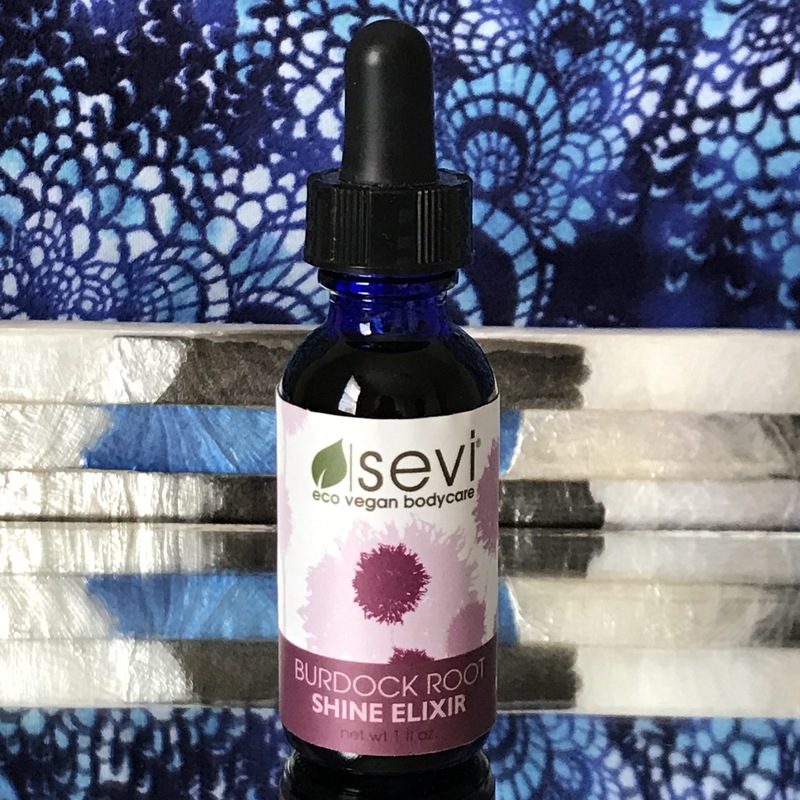 The Burdock Root Shine Elixir contains unique ingredients including Burdock Root Infused Meadowfoam Seed Oil, Broccoli Seed Oil, Seabuckthorn Berry CO2, and Sandalwood and Neroli Essential Oils. This elixir has a slightly sweet and herbal fragrance, and I only needed 4-5 drops to work through my curly, down-to-middle-of-my-back length hair. My hair is dry and color treated so it is not shiny on its own. This elixir helped to hydrate my locks while giving it a slight oh-hey-my-hair-looks-healthier sheen when I used it on my damp hair. When I massaged this product into my dry hair it helped to tame my crazy curls. Don’t use too much or your hair will look greasy! It is made of oils after all! I tried the Maranta Dry Hair Shampoo: Vegan Hair Powder in the shade Neutral, which is a white powder that blended right into my blonde hair. This product contains Arrowroot Powder, Tapioca Starch, Moroccan Lava Clay, and Green Mandarin, Myrrh and Neroli Essential Oils. It is a fine powder with a light herbal scent. When I sprinkled this dry shampoo on my hair after a long day of sweating at work (the AC was broken), it seemed to absorb the sweat and oils that had built up over the day. I massaged it vigorously into my roots and it also helped to build volume. I am a fan of shampooing my hair several times a week and conditioning it almost every day, so I do not use dry shampoo very often. In a pinch, I would use this product to freshen my hair up on nights that I am too tired to shower or I would maybe even take it along with me to fix my hair during the workday. 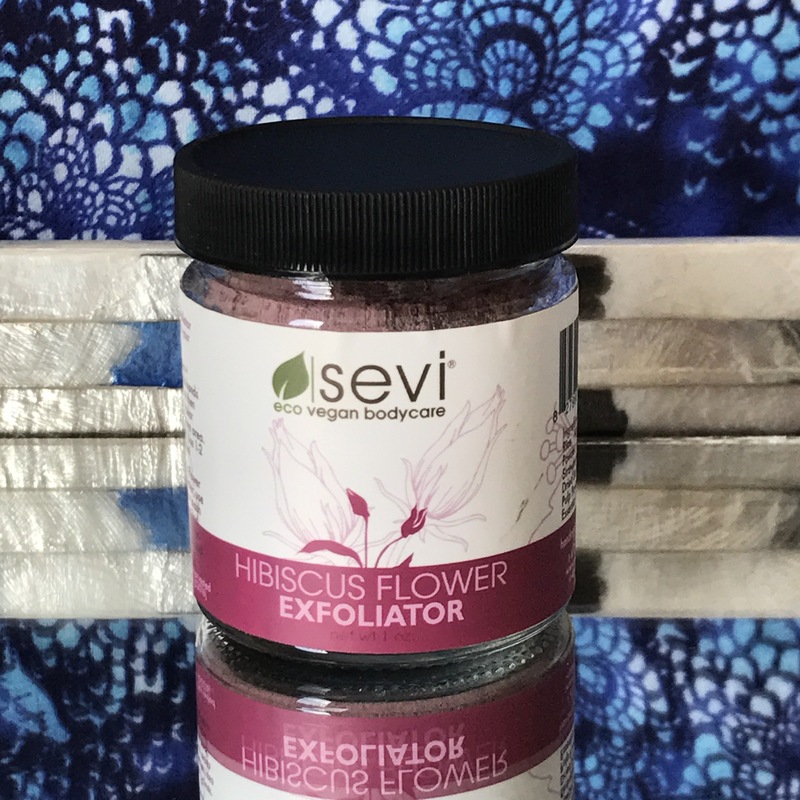 If you’re looking for a unique product to exfoliate your skin, The Hibiscus Flower Facial Exfoliator is it! This purple powder is made of Organic Brown Rice, Hibiscus Flower Powder, Freeze Dried Strawberries, Freeze Dried Bananas, and Acai Pulp Powder! How cool is that? When you add water, this product turns into a vibrant magenta color and gently scrubs away dirt, oil and dead skin cells from your face. It leaves your skin feeling smooth and soft while looking toned and healthy! It has a fresh scent of fruit and flowers and is fun to use! 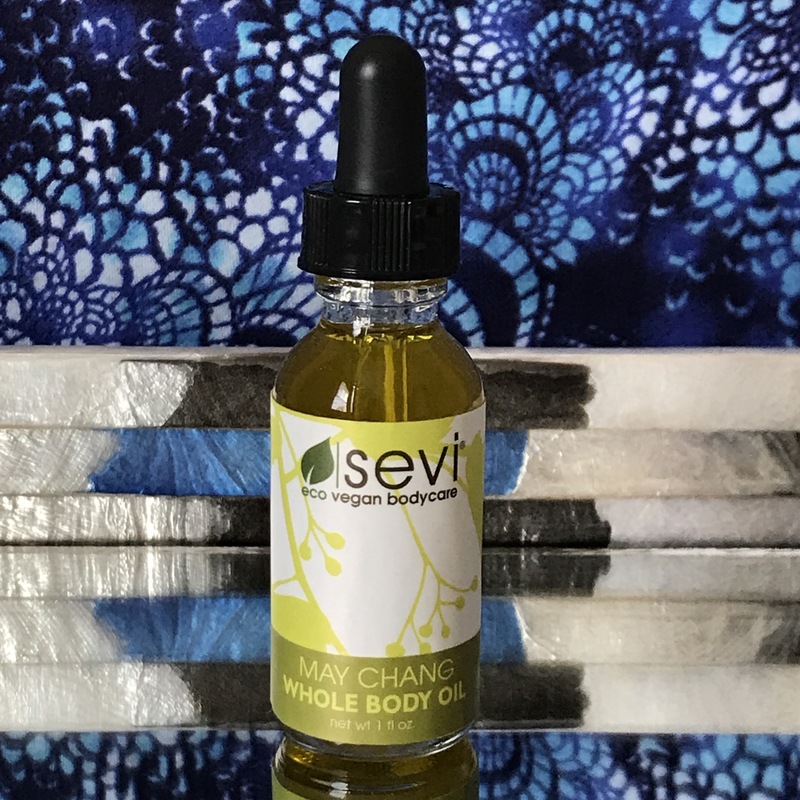 The May Chang Whole Body Oil is made of plenty of good-for-you ingredients including Organic Unrefined Avocado Oil Organic Golden Jojoba Oil, Organic Seabuckthorn Berry Extract, and Pure Essential Oils. It absorbs quickly into the skin and has a natural herbal scent. It effectively moisturizes the skin, but what I like best about it is the sheen it leaves behind. Who doesn’t love a healthy glow? I truly enjoyed using these products! The Hibiscus Flower Facial Exfoliator was my favorite. I love the color and how it left my skin feeling healthy and soft! All four of these products are excellent quality and do the job they were intended to do. I would highly recommend Sevi products to anyone looking for vegan and cruelty-free products that are unique and naturally effective! 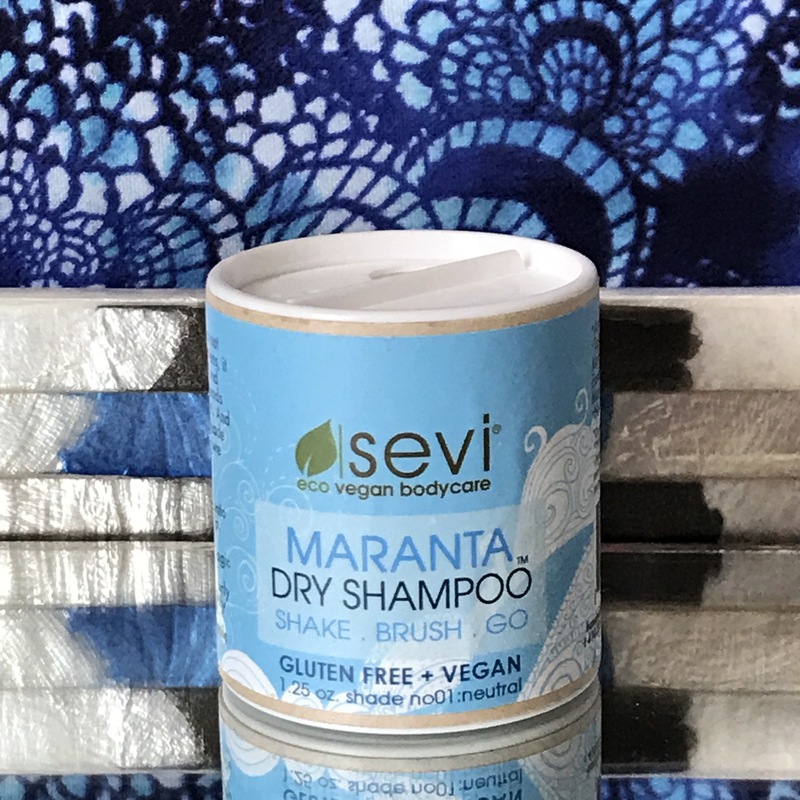 Thank you, Sevi Eco Vegan Body Care for these fabulous products to review!